If you can’t go home for the Holidays where can you go? Simple, the Crossroads Community Church located at 331 Dillon Ave, Mankato, MN 56001. If you’re coming from campus the church is right next to the preforming arts building, right behind the Trafton Science building. The church will be hosting their 1st FREE community Thanksgiving on Thursday, Nov. 22nd at 1 p.m. The event is for students, staff, faculty and friends. As the Crossroads motto is, “welcoming everyone of good will, no exception,” all will be welcomed at this event. Those interested in attending do not have to be Christian. There will be a free will offering basket if attendees are interested in donating. “Food is provided, just bring yourself and your smile,” said Pastor Heath. The menu will feature a traditional Midwest thanksgiving meal with foods such as turkey, squash, cranberries mashed potatoes, as well as apple and pumpkin pie. There will be no pork provided but, there will be board games available for those attending the meal to enjoy. The church is looking for volunteers to help decorate tables for the thanksgiving meal. If you are interested in volunteering or need more information please contact Pastor Heather Hammond, Crossroads Pastor at CrossroadsAdvocate@gmail.com. If you’re not interested in attending the meal but need food during holiday breaks consider visiting Crossroads Community Church. The go-to place for students who need a meal or groceries for the week. Every Tuesday, the campus cupboard and campus kitchen are open to students. 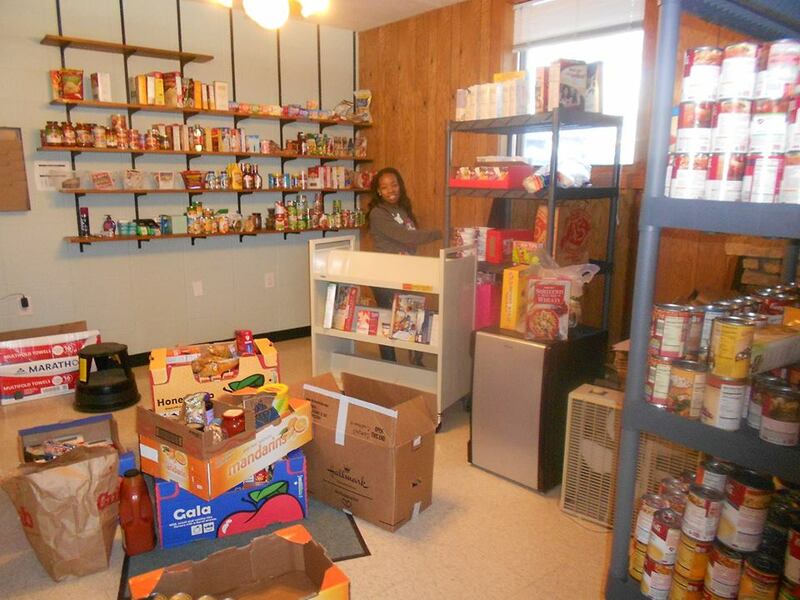 The goal of campus cupboard is to provide food for students who need help. Overall, Crossroads has had 170 people come through campus cupboard. Every Tuesday from noon to 3:00 p.m. students with their MavCard are able to get one full bag of groceries for free. There are typically 30-40 people for campus cupboard on Tuesdays. Additionally, every Tuesday from 11:00 a.m. to 1 p.m. the church has $1 lunches available to students, faculty, staff and community members. Usually have 30-60 people come through on Tuesdays for these meals and on average 45 people attend. For more information, visit Crossroads Community Church’s website at: https://crossroadsatmnsu.org and click on either the Campus Kitchen or Campus Cupboard tabs located at the top of the homepage.